On Friday, November 9, 2018, the Bel Air Girls’ Varsity Volleyball Team played in the Regional Final game at Bel Air High School against Towson High School. The Bobcats swept the Generals 3-0, allowing them to advance to the State Semi-final game. The winner of this game would receive the opportunity to play at the Ritchie Coliseum at the University of Maryland in College Park to play in the State Semifinal game. 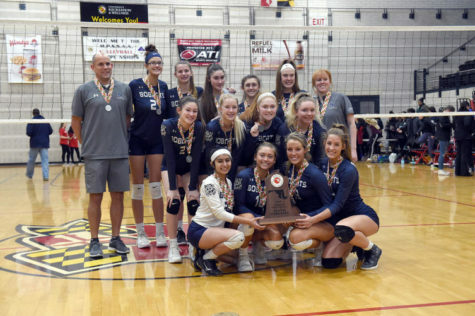 With great defense and dominating serves, the Bobcats captured their first regional championship in six years. Scores were 25-12, 29-27 and 25-12. “This was a huge win for us. We never stopped believing in ourselves and winning this regional title is a huge accomplishment for us, but we have bigger plans in store,” says senior captain Megan Hoy. Other key contributors in this match were senior Erin Kenney (two kills), junior McKenna Reiswig (one kill, one block) and junior Jay Harden (one ace, one dig). “Playing at the University of Maryland is a huge deal in playoffs. Knowing we’re one of four teams left in the state is an amazing achievement and that will act as a huge confidence booster for us in this next game,” says junior McKenna Reiswig.